For 2-odd years now I'm very lucky with my Eizo S2411W. Most of the time I'm surfing the web, writing code or do photoshopping. Usually at the end of the year you try to spend some money, and as I feel that displays have become real keen now (as opposed to RAM, which where half the price a year ago) I decided to get me a smaller additional pivot display, especially nice for reading or writing large text and code. I ordered a Samsung SyncMaster 2243BW, as this display was one of the lowest priced models for around EUR 180 with 22 inch and pivot stand. Shortly after the arrival and setup of the display I noticed that these so popular TN-Panels had much worse viewing angle properties than I was expecting. Of course I knew about the properties of TN panels, that's why I was buying the Eizo 2 years ago having a S-PVA panel, offering the best color reproduction, highest font detail, constant color and contrast over the full viewing angle compared to any other LCD technology. My disappointment over the extraordinary nasty color shifts occurring on little viewing angle changes leaded me to the decision to get another display for comparison. I have heard IPS technology made some advantages in the past, and as you can get displays with this type of panel for little extra money compared to TN panels I decided to give them a try. The second display I ordered was a Dell 2209WA having an E-IPS panel as this was nearly the lowest price 22 inch model with pivot stand and E-IPS panel for around EUR 250. On the following figure you can see the difference in color and contrast reproduction on a tilted viewing angle. 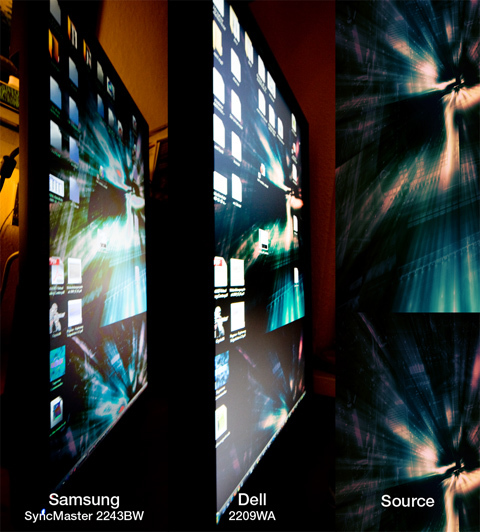 On the left, the Samsung, its fairly recognizable that light tones are shifted dramatically to green, red, grey, and even white is shifted to blue, wheres blue is shifted to green. And the more darker mid-tones become very vibrant, loosing a lot of tonal detail. Depending on the viewing angle this changes all the time. So if you are looking for wicked spectral effects this display might be interesting for you, although I prefer the reproduction quality can be seen on the second photograph - the IPS panel of the Dell display reveals nearly no color shifts even on highly tilted viewing angles. One downside even for Dells IPS' - the black parts get clearly brighter on larger angles, but this effect is at least in daylight situation negligible. Both shots are taken and processed with totally equal settings.